Thursday, February 19th, 2015 is the Lunar New Year. While it is just another workday here in the Upper Midwest, most of East and Southeast Asia will or have started the Chinese New Year Eve celebrations with a big family Reunion Dinner. This is a much anticipated event as grown children travel home to be with parents for this feast. We would do the same if we live closer to my parents. Oh, how I miss the festivities in Kuala Lumpur! The countdown to the celebrations in the shopping malls and public places makes it all the more exciting. Many families still make and bake cookies like Kuih Bangkit (Tapioca Cookies) and Chinese Peanut Cookies to ring in the New Year while others go on food shopping sprees. One of the most busy places during this period are the Chinese grocery stores selling all kinds of dried ingredients, some of which go into Chap Chai (Mixed Vegetables). There are many versions of Chap Chai. Some are braised while others are stir fried. 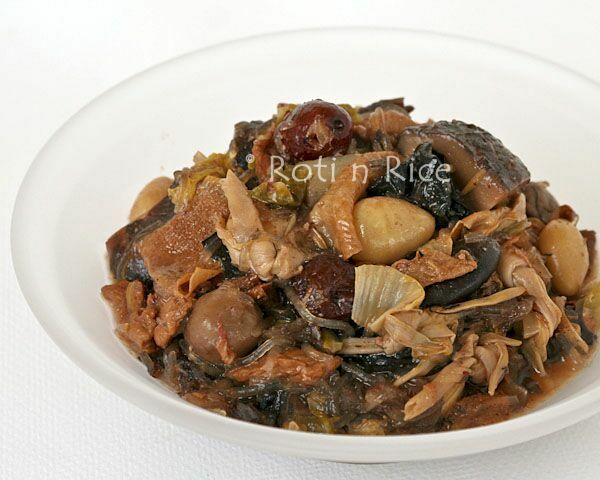 Mom usually prepares the braised version with at least 12 to 15 auspicious ingredients eaten throughout Chinese New Year day. Everyone in the family looks forward to this dish. Its winning combination of ingredients certainly makes it a great start for the New Year. 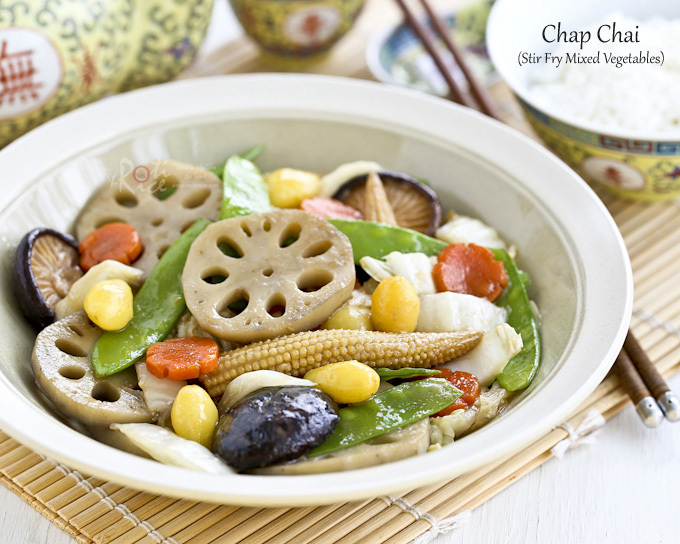 For the Reunion Dinner, a lighter and more colorful version of Chap Chai (Stir Fry Mixed Vegetables) is often prepared. The types of vegetables used may vary from family to family. 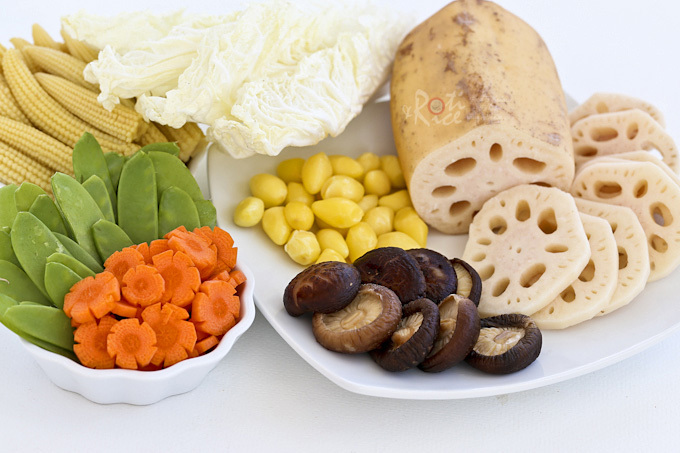 Mushrooms (for longevity), carrots (considered red for good luck), baby corn (for growth), and snow peas (for unity) are usually the mainstays. 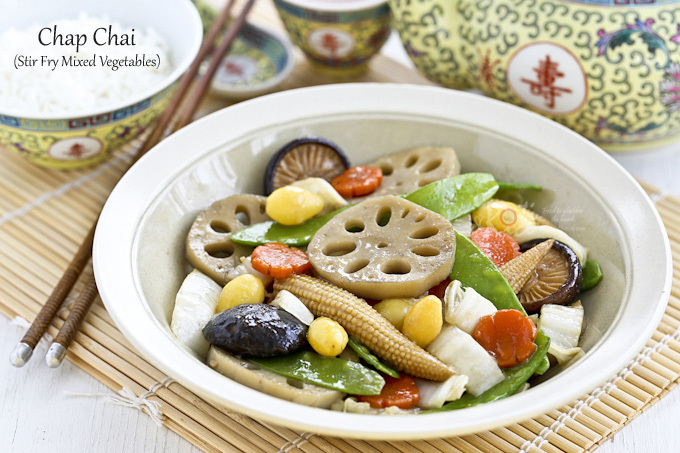 I like to include lotus root and ginkgo nuts which are symbolic of abundance and silver (wealth) respectively. These two ingredients also add texture and color to this tasty dish. 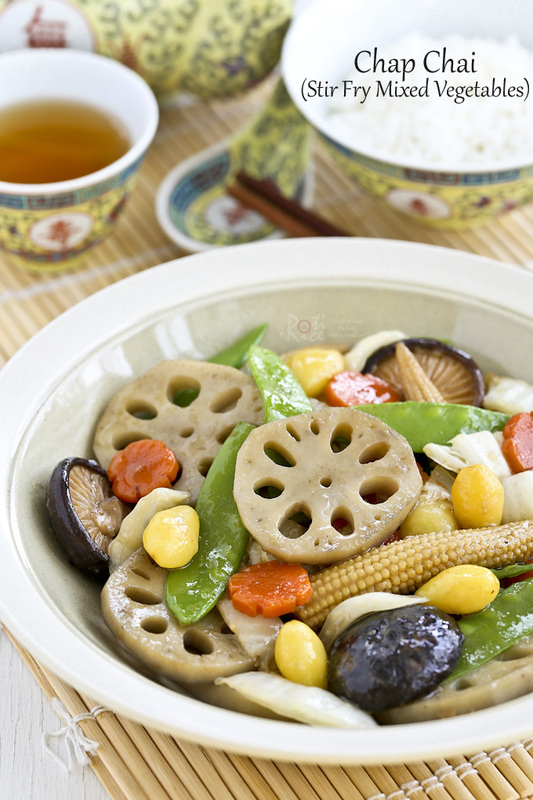 The lotus root and ginkgo nuts have to be parboiled beforehand. For convenience, I used ready shelled and peeled ginkgo nuts which come in 3.5 oz (100g) packages found at most Asian grocery stores. Bring a small saucepan of water to boil. Add 1 tablespoon vinegar and ¼ tsp salt followed by lotus root. Cook for 2 minutes. Remove lotus root, rinse in cold water, and drain. Set aside. Discard water from saucepan. Fill with fresh water and bring it to a boil. Add ginkgo nuts and cook for 5 minutes. Remove and drain. Set aside. Heat vegetable oil in a wok or large fry pan. Add mince garlic. Stir fry for 20 seconds. Add mushroom caps and carrots. Stir fry for 2 minutes. Add ginkgo nuts, baby corn, and cooked lotus root. Stir fry for 2 minutes. Add soy sauce and Shao Hsing rice wine and continue to cook for another 2 minutes. Add Napa cabbage and snow peas. Season with salt. Stir fry for 2 more minutes. Pour in corn starch mixture and allow sauce to thicken. Turn off stove and drizzle sesame oil over vegetables. I hope you will give this quick and easy Chap Chai (Stir Fry Mixed Vegetables) a try. There is still time to cook this dish for your Reunion Dinner or Chinese New Year get-together if you live here in North America. The ingredients can be found at most Asian grocery stores. May the Year of the Goat/Sheep bring you good health, prosperity, and much joy. Lotus root?? how cool is that vegetable! I have to find it now! You should be able to find fresh lotus root at most Asian grocery stores. They may also carry those in brine if fresh ones are not available. Your Chap Chai is so beautiful! Gong Xi Fa Cai to you and your family. Xin Nian Kuai Le to you and the family, Linda! Your chap chai looks so vibrant and I bet it is delicious. We were blessed to have mum celebrating CNY with us this year and she made this dish too by adding homemade gluten balls, mung bean vermicelli and fatt choy. All gone in a matter of seconds….